This entry was posted in Intriguing Products. Bookmark the permalink. Peaberry must be blended with Robusta (50:50) for asli South Indian coffee. Ah, coffee! Once upon a time, my Sunday morning ritual was to roast beans and make a cup of South Indian filter coffee as soon as they cooled enough for me to grind them. Even the next day, they did not have the same flavor. There was only one place in Seattle that sold unroasted coffee beans, and as they were open only weekdays, I had to periodically drive 30 miles each way from work to get beans. Marriage, home ownership and children ended that habit! I am not sure that I would go so far as to call Peaberry the champagne of coffees. South Indian Peaberry (maybe from Coorg) is indeed good coffee, but there are good Peaberry coffees from elsewhere – our local Trader Joes often carries them. That term should be used for Jamaica Blue Mountain (there is more Blue Mountain coffee sold than grown; go figure), Hawaiian Kona or Sulawesi Kalossi (which I have not found lately, but I think it’s under-appreciated). Some people think Kopi Luwak is the best coffee (it is supposed to be the most expensive), but I have never come across it and even if I were to, I am not sure I would be able to bring myself to drink it. Coffee around Delhi is still pretty pathetic. I spent a week in Noida last year, and at the guest house where I stayed, I asked for coffee just once and swore never again. The company where I spent my days had an espresso machine in the cafeteria; its main saving grace. A friend and I met one evening for coffee at a Costa’s in a mall. While it was nothing to write home about, the fact that it was the best coffee I had all week speaks to the coffee in Delhi. I have tasted Kopi Luwak, it’s pretty darned good. Not worth the $12 I paid for the cup of it in 2002 (it’s 3 times that much now), but still mellow and flavorful. 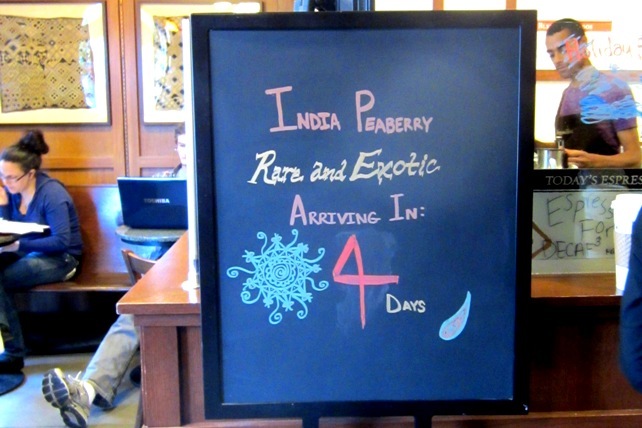 I have never tasted Peaberry but I see it’s in its last week at Peet’s again, so may have to try it out. For myself, pure Kona has to be my favorite coffee. Jamaican Blue Mountain does nothing for me, I don’t understand the hype about it. I grew up with indian peaberry from Phillips coffee in Mumbai, later I blended peaberry with a little French coffee to add a little chicory flavor which for me was the perfect blend, later as I moved around south east Asia I chanced upon kopi luwak which was more earthy and great. Now I stuck to kopi luwak and a few brands of Sumatran coffee as I am now in china, but have been using peaberry whenever I go back to Mumbai. But I freshly grind the beans everyday for the taste of freshness.